The potato, in general, is a starchy tuber vegetable from the Solanaceae or nightshade family, which also includes eggplant, tomatoes, and peppers. The blue-violet or purple potato is an heirloom fingerling potato. Although the purple potato is a beautiful adornment to any plate, it is much more than that. Antioxidant-rich purple potatoes offer loads of health benefits, including regulating blood pressure, preventing blood clots, improving endurance, and more. The following article will give you further insight into the purple potato, including its impressive nutrition content, incredible health benefits, and even how to use this uniquely colored spud. The purple fingerling potato has special names such as purple Peruvian, purple Viking, and purple majesty. This golf ball-sized potato is available all year long, and they reach a slightly large size when allowed to reach full maturity. It is popular in South America, and native to the Lake Titicaca region without the mountain slopes and high plains of Bolivia and Peru. The purple potato has been cultivated for nearly 8,000 years in the Andean regions of Ecuador, Bolivia, and Peru. The potato’s resistance to disease and ability to withstand harsh conditions has allowed it to evolve for thousands of year, and today are cultivated throughout Europe, North America, and South America. All potatoes are high in carbohydrates, fiber, minerals, and vitamins. However, the colorful flesh of the purple potato makes them the most nutrient dense of them all. What are the purple potato nutrition facts? One medium raw potato contains 34.2 g of carbohydrates, 3.6 g of fiber, and 4 g of protein. From a micronutrient perspective, purple potatoes contain almost a third of the recommended daily amount of potassium and vitamin C. These potatoes are also a great source of manganese, phosphorus, magnesium, copper, iron, calcium, zinc, selenium, vitamin K, vitamin B1, vitamin B2, vitamin B3, vitamin B5, vitamin B6, folate, choline, and betaine. The following is a comprehensive purple potato nutrition chart with information for a medium raw potato, or 213 g of the vegetable. What are the health benefits of purple potatoes? The antioxidants, phytonutrients, and fiber jammed into these spuds are responsible for many of the purple potato health benefits. For instance, the soluble fiber in purple potatoes is excellent for smooth digestion and eliminating constipation. Purple potatoes could also help regulate blood pressure and prevent blood clots. The anthocyanins in purple potatoes also make for a natural food and beverage coloring. Let’s take a deeper look at the potential purple potato benefits, and what you need to know about them. The purple potato is a great source of antioxidants and phytonutrients, which together may reduce inflammation and offer other excellent health benefits. Anthocyanin in particular is what gives this potato its purple color. However, the anthocyanin pigments are also responsible for the purple potatoes antioxidant and free-radical scavenging abilities. ForThe antioxidants, phytonutrients, and fiber jammed into these spuds are responsible for many of the purple potato health benefits. centuries, anthocyanin has been used in folk medicine for hypertension, liver dysfunction, and lowering the risk of infections and eye diseases. A study presented by the American Chemical Society in 2011 found that eating plain purple potatoes baked or cooked in the microwave may reduce blood pressure in patients by three percent to four percent with weight gain. This result is likely from potatoes effect on the blood vessels and capillaries, and their high amount of a phytochemical called chlorogenic acid, which has lowered blood pressure in certain studies. The potassium in purple potatoes also help regulate blood pressure. Approximately eight percent of the U.S. population has one of several genetic risk factors that increase the risk of blood clots. A proper diet can help you prevent blood clotting, and adding a purple potato could possibly help with that. 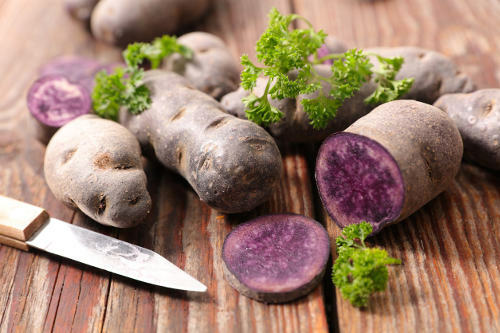 The chlorogenic acid in purple potatoes can help break down blood clots while inhibiting the enzymatic activity of procoagulant proteins and peptides. Research published in the Journal of Biochemical and Molecular Toxicology early this year found that chlorogenic acid would delay blood clot formation in mice. As a result, the anti-clotting effect of the phytochemical makes chlorogenic acid a possible agent in the prevention and treatment of blood clots. There are a number of chemical food dyes that are linked to cancer. Fortunately, the anthocyanins in purple sweet potatoes provide a natural replacement for beverage and food coloring that is used for vitamin waters, fruit drinks, yogurt, and ice cream. They are a stable option since they don’t break down easily, and they provide the desired color with giving little to no taste. Although difficult to extract, purple sweet potato anthocyanins are much better than traditional synthetic colorings that are extracted from cochineal insects. The purple potato is a staple in South American kitchens. It is often dry and starchy with an earthy, nutty flavor, which makes it a great side dish for almost any meal. Although versatile, purple potatoes can become mushy if overcooked. Boiling and baking purple potatoes are the best methods rather than frying, which kills key nutrients. It is a good idea to add seasoning to the purple potato since the flavor is more subtle than other potatoes. Try using a little olive oil and some pepper and salt. The following are a couple of purple potato recipes to help you in the kitchen with this colorful little tuber. Preheat the oven to 375° Fahrenheit. Slice the leeks, green onions, and garlic, and set aside. Rinse the potatoes, and cut them in small pieces that are about a quarter inch in thickness. In a bowl, mix the leeks, onions, garlic, thyme, oregano, and potatoes with the coconut oil. Add the pepper, salt, and chopped rosemary, and combine well. Place the potatoes on a baking sheet lined with parchment paper, and roast for 35 to 45 minutes, or until the potatoes are soft and begin to brown. Place a half cup on a plate as a side serving, and garnish with a rosemary sprig. Place the grated purple potatoes into cold water, drain in a colander, and squeeze them dry by pressing with your hands. Put the grated potatoes in a cheesecloth, or use a few layers of paper towels. Pull on the sides and squeeze out as much water as possible. Grate the onions, drain them, and squeeze out the water like you did with the potatoes. Combine the potatoes, onions, and chopped parsley. Beat the egg lightly with pepper, salt, and oregano, and add to the potato mixture. Add the quinoa flour, and stir to combine well. In a little bit of oil, drop a tablespoon at a time of the mixture, and flatten them with the back of a spoon. Reduce the heat so the fritters cook through evenly, and when one side as browned, turn them over to brown the other side. Lift them out, and place them on paper towels when they are done. Serve immediately. There are generally no risks associated with purple potato consumption; however, if you do experience a reaction, stop eating them right away. Overall, the purple potato is excellent for your health, especially when roasted in the oven. It also contains key antioxidants and phytonutrients that help reduce inflammation, while also lowering blood pressure and protecting against blood clots. The fiber in purple spuds is also useful for digestive issues like constipation, while the potassium and carbs in this potato may help with endurance athletes during long-distance activities like marathons. “Purple Potatoes,” Specialty Produce; http://www.specialtyproduce.com/produce/Purple_Potatoes_641.php, last accessed June 7, 2017. Norek, D., “Purple potatoes pack serious antioxidants compared to their fleshed counterparts,” Natural News, Aug. 5, 2013; http://www.naturalnews.com/041491_purple_potatoes_antioxidants_nutrition.html, last accessed June 7, 2017. “Purple Potatoes Nutrition Facts,” SFGATE; http://healthyeating.sfgate.com/purple-potatoes-nutrition-2182.html, last accessed June 7, 2017. “Potatoes, red, flesh and skin, raw Nutrition Facts & Calories,” SELFNutritionData; http://nutritiondata.self.com/facts/vegetables-and-vegetable-products/2549/2, last accessed June 7, 2017. Lila, M.A., “Anthocyanins and Human Health: An In Vitro Investigative Approach,” Journal of Biomedicine and Biotechnology,” Dec. 1, 2004; 2004(5): 306-313, doi: 10.1155/S111072430440401X. Warner, J., “Purple Potatoes Lower Blood Pressure,” WebMD, Aug. 31, 2011; http://www.webmd.com/hypertension-high-blood-pressure/news/20110830/purple-potatoes-lower-blood-pressure. Choi, J.H., et al., “Investigation of the anticoagulant and antithrombotic effects of chlorogenic acid,” Journal of Biochemical and Molecular Toxicology, March 2017; 31(3), doi : 10.1002/jbt.21865. Bastone, K., et al., “Potatoes: The Perfect Carb,” Runner’s World, Aug. 2, 2007; http://www.runnersworld.com/recipes/potatoes-the-perfect-carb, last accessed June 6, 2017. “Purple Potato Latkes,” eCurry; http://www.ecurry.com/blog/starters-snacks/purple-potato-latkes/, last accessed June 7, 2017. “Antioxidant-Loaded Purple Potatoes: The Healthy, Versatile Carb,” Dr. Axe; https://draxe.com/purple-potatoes/, last accessed June 7, 2017.